Hello everyone (•̤ ॢꇴ•̤ ॢ). I've changed my hair color again last week. Actually, I decided to color my hair because my black roots already showed up. I still love my hair color in this post but you can see the black roots there and I was super lazy to bleach my hair again. That's why I decided to choose darker color from all my hair dye collection. And it's Candy Pink from Beauty Labo. I guess some people saw the result already on my Instagram, hahhaha! And how it looks outside, under sun light. lol please excuse my messy hair, I'm so lazy to style it today. ✧ Where I got my Beauty Labo? 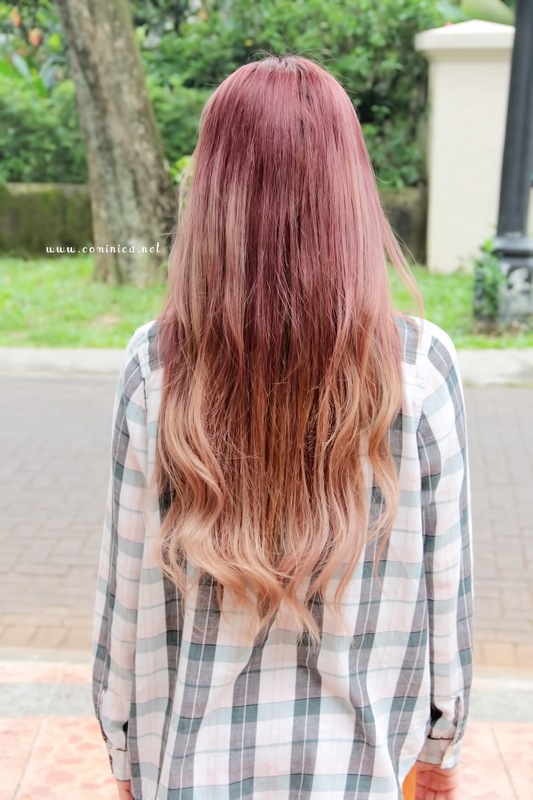 Your new hair colour is really sweet ouo It looks nice in as ombre imo. A very pretty radiant colour!! suka banget ce sama rambut barunya, kereeenn! In love with the gradient!! That outfit really fits you (no matter you're talking about your hair) and well, yeah, I like this new colour, looks really cute. bagus banget? available di online shop aja? atoo dah ada di local store? cantiik bgt comi, warna gradiasi nya baguus <3 . the colour suits you very well! I love how you're never afraid to try out new colours! actually not much, hahah mostly from Dolly Wink. I usually use the same product every time I do my make up. Eyeshadow from Dolly wink, eyeliner, mascara and false lashes.